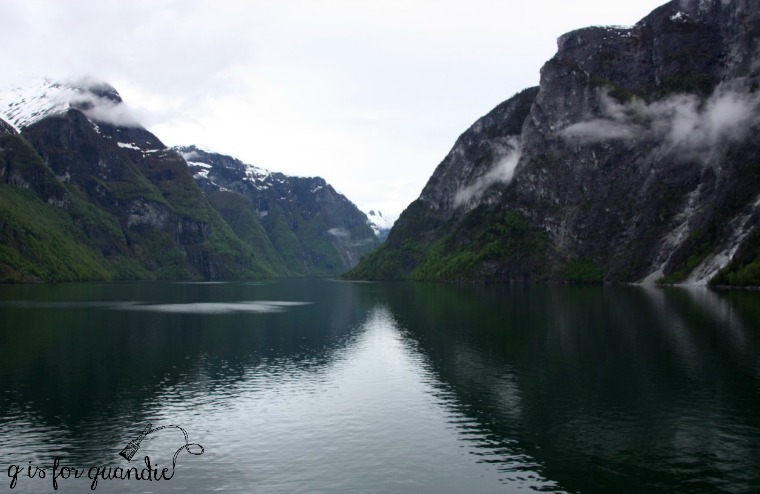 For those of you who may be new to my blog, in May Mr. Q and I took a Holland America cruise to Norway and Scotland. I’ve been slowly posting about each of our ports of call on Wednesdays. So far we started in Copenhagen, then went to Oslo, Kristiansand and Stavanger in Norway. 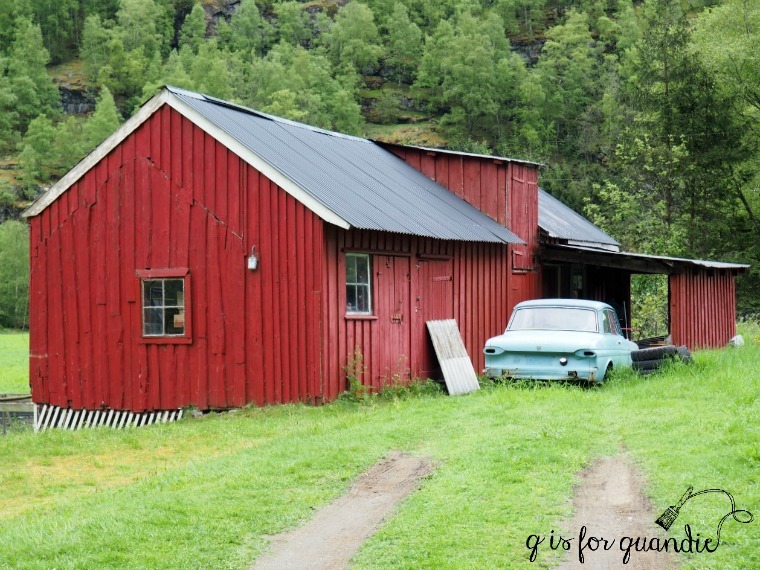 Today I’m sharing our next port of call, Flåm, Norway. 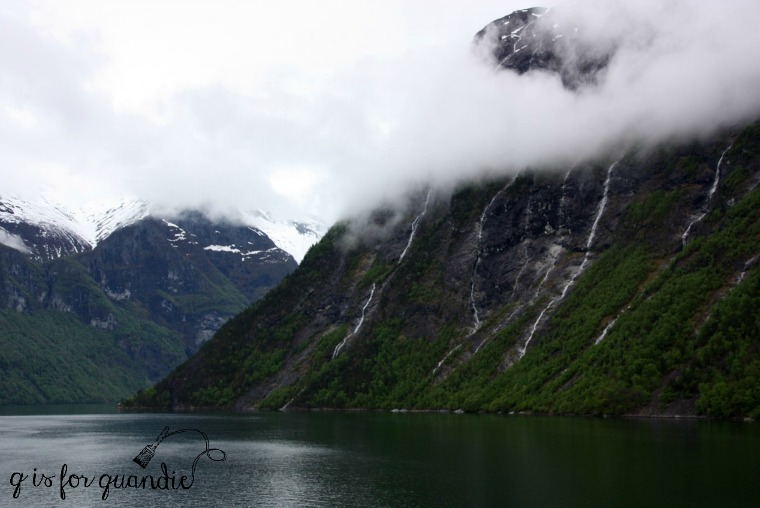 I have to say that sailing down the Sognefjord and the Aurlandsfjord to Flåm was one of the most amazing travel experiences I’ve ever had. Mr. Q and I woke up in the very early hours to this view outside our window. passing about a gajillion waterfalls. By the way, this was one of the moments on our cruise when we were really glad we upgraded to a balcony cabin at the last minute. We were sailing through here at about 6 a.m. It was easy to just pop out of bed, walk out on the balcony and enjoy the scenery. Had we been in an inside cabin I am quite sure we would have slept right through this, and wouldn’t that have been a shame? 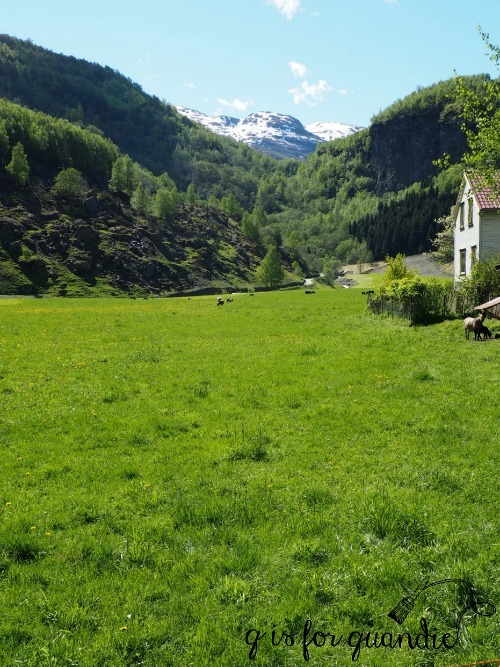 We passed the little town of Undredal. 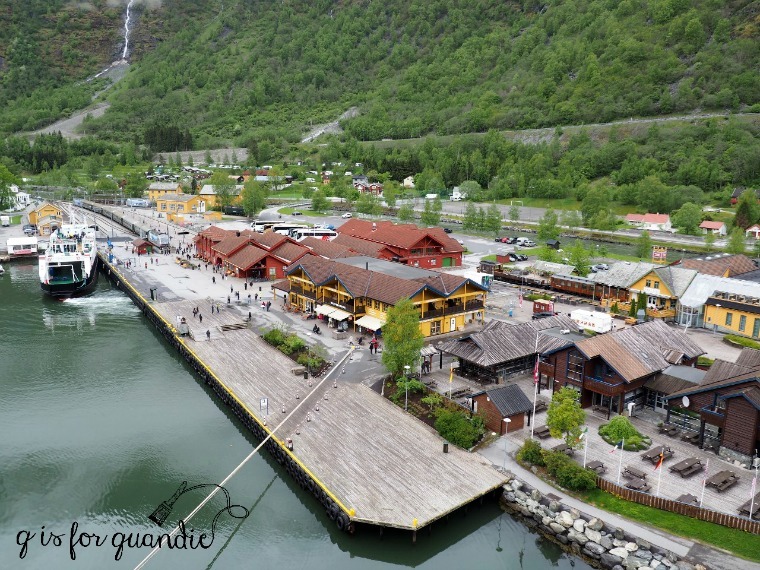 We docked in Flåm around 8 a.m. 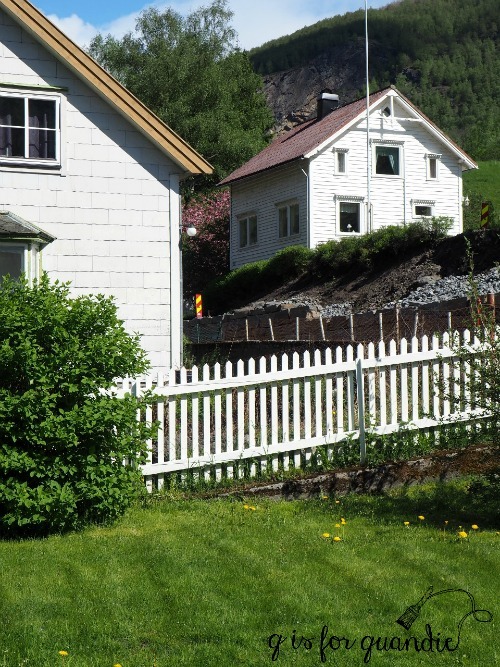 The immediate area around the dock in Flåm is very touristy. There is a huge souvenir shop, a tourist info center, a couple of restaurants, the train museum and the train station. I would say that probably 99% of the passengers on our ship either took the scenic train ride, or else they took a fjord cruise right from here. We decided to do something else altogether. 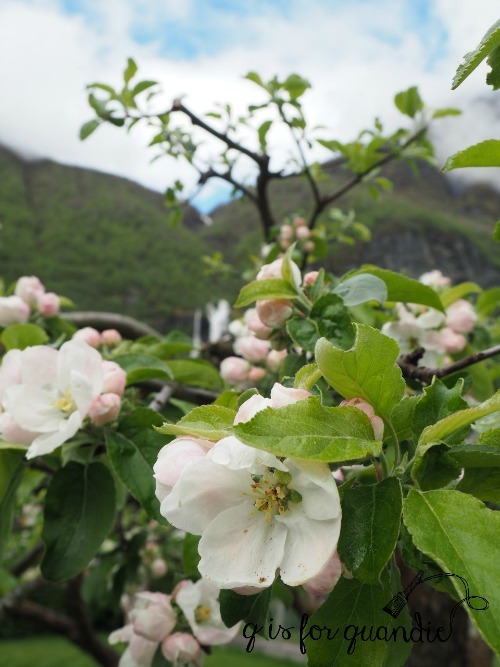 We walked the 3 km along a rushing stream to the real town of Flåm. 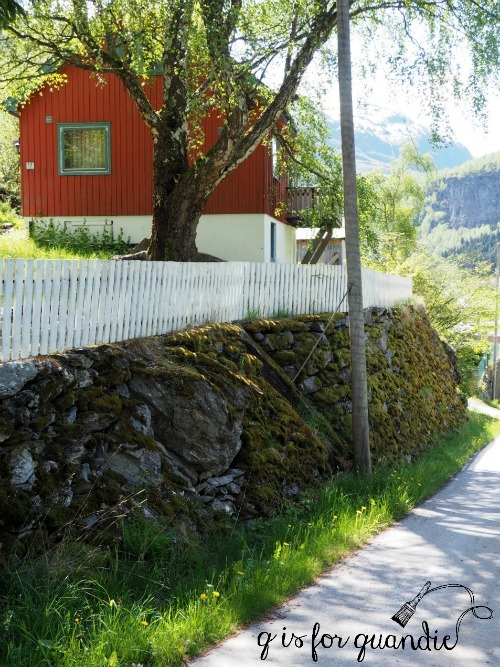 According to the Rick Steves guidebook there isn’t much to see in Flåm proper and no real reason to go there, and I suppose he is right if you are looking for castles, museums, historic sites or other tourists. He recommends taking the scenic train ride, as do most people I know who’ve been to this area. But if you prefer your stunning scenery without having to battle for elbow room with 300 other tourists, well, then I recommend this walk instead. Is anyone else tempted to break into song looking at that picture? 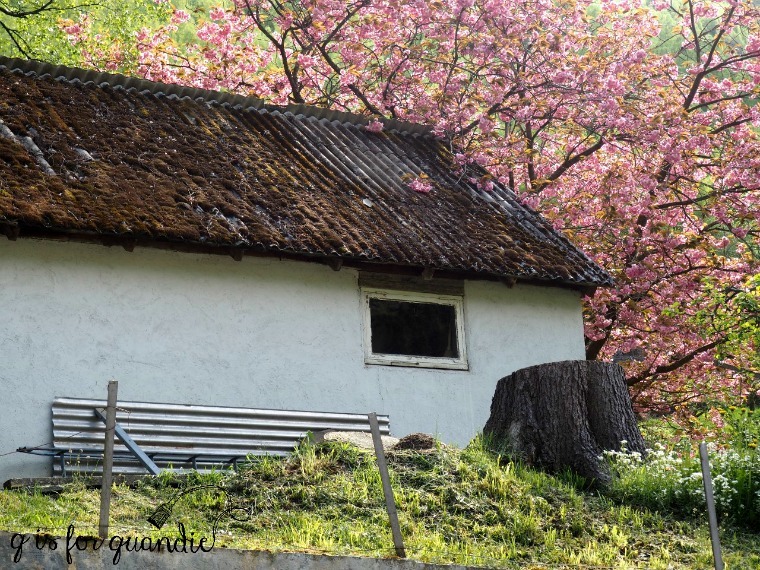 The hills are alive, with the sound of music … wait, wrong country. This place simply could not have been any more beautiful. As we walked further and further up the valley, the sun got brighter and the air got warmer. It was so peaceful and quiet. We saw very few other people. Our final destination was the old church. 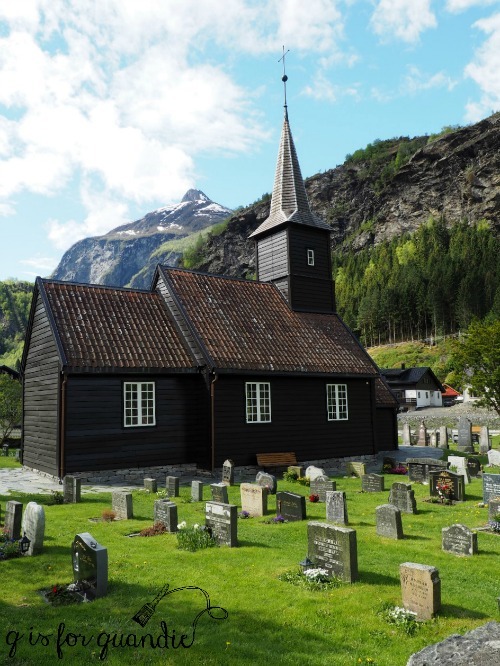 This church was built in 1670 (or 1667 depending on the source) and replaced the original stave church that once stood in this spot. And P.S., there is a handy (and free) public restroom at the church. We wandered around the tiny cluster of homes that made up the ‘downtown’ hoping to find somewhere to get coffee, but no such luck. 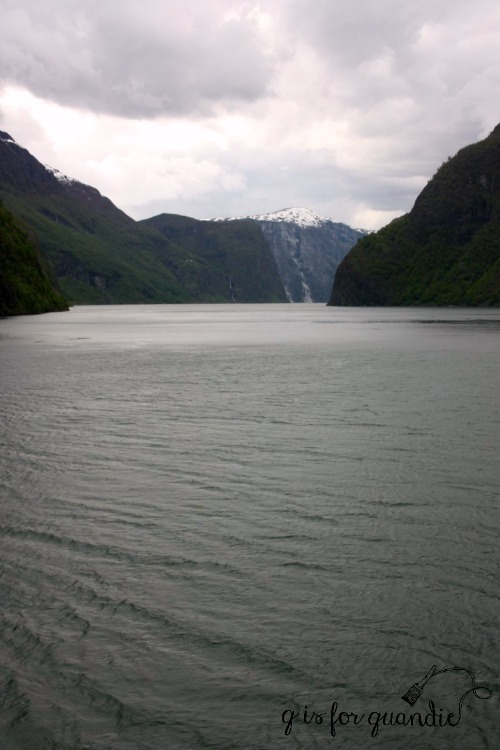 So we turned around and headed back to our ship, which was getting ready to sail back down the fjord and out to sea. Shortly before sailing, our captain made an announcement that a pod of Orca’s had been sighted in the Nærøyfjord. So although our ship was too big to go very far down that fjord, he was going to take a detour down it to see if we could spot them. 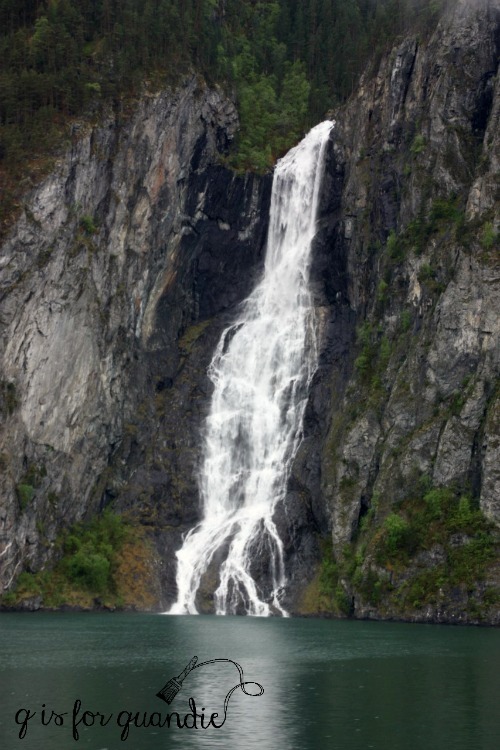 Unfortunately we never saw them, but we did enjoy the dramatic scenery of the Nærøyfjord. I think the most entertaining part was seeing how the ship did a complete 180 degree turn to get back out again! This truly was one of my favorite days on our trip. 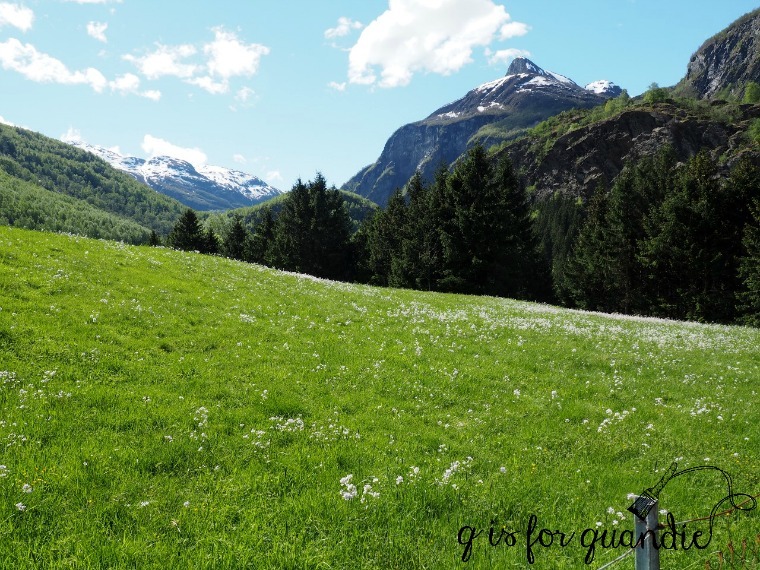 Mr. Q and I both really enjoyed being surrounded by spectacular scenery during our peaceful walk up the valley, as we practically had the place to ourselves. 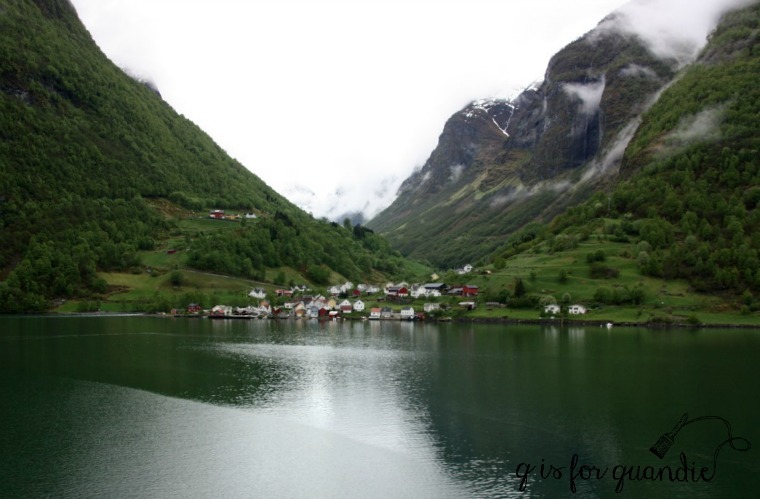 We also loved sailing through the fjords. 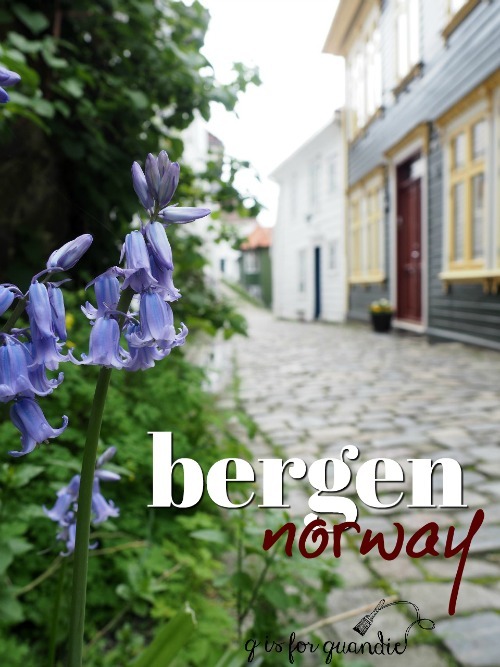 Next Wednesday I’ll share our last port of call in Norway, Bergen (which we definitely did not have to ourselves)! I hope you’ll stay tuned. Previous the seed & horticulture dresser. Wow. I can see why you chose the peaceful quaint route. I don’t think I could have talked my husband out of the ‘touristy’ part so kudos to Mr Q for being your partner in authentic traveling and exploring. I have always heard that you don’t see a place until you live like a native. Made me wonder how close that town was to a larger metropolis and gosh do they order everything from Amazon? But calm and breathtaking beautiful was my take on the mini tour you provided to us today. Also I can see why there are fairie and gnome stories coming from that part of the world. Everything looks so magical. Thanks for sharing. Just wait until I share the faerie glen from the Isle of Skye! 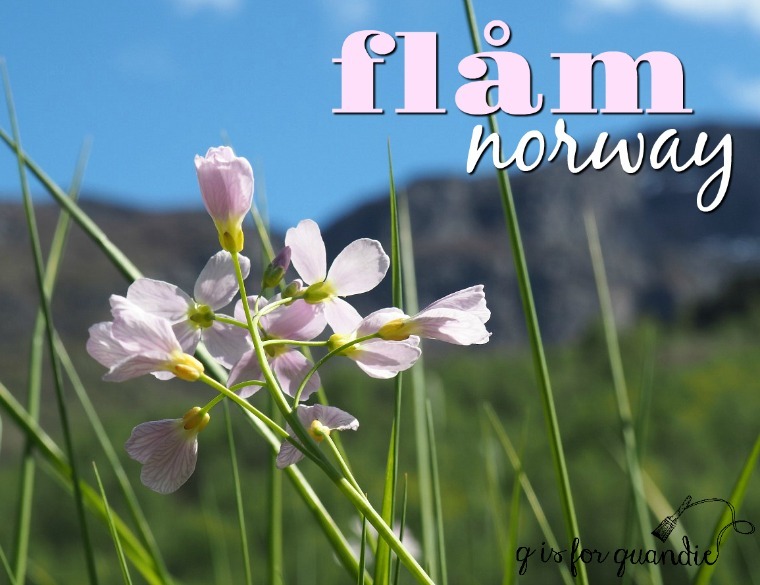 Flam was definitely one of the highlights of our trip! Beautiful pics! Thanks for sharing. 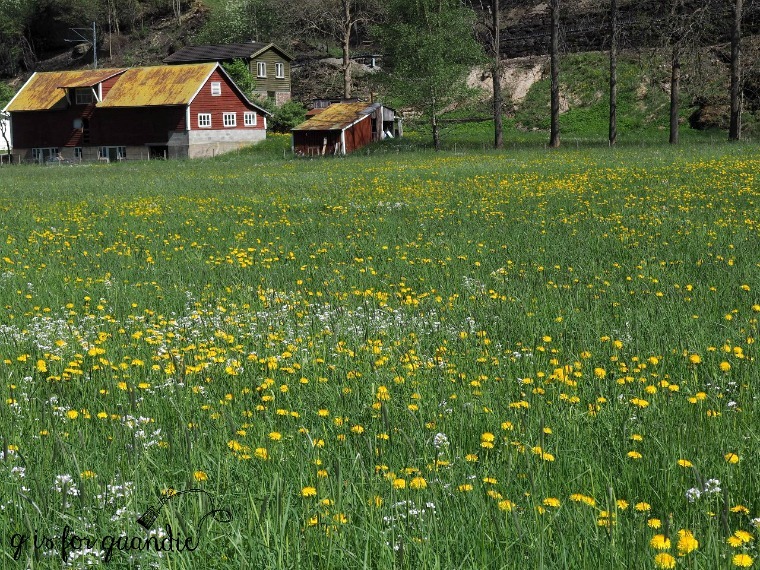 I have to ask, are the yellow flowers from your walk up the valley Dandelions? …awesome day. Loved it. Thanks for the morning perk. Thanks for sharing this part of your journey. Your photos really make me feel like I’m there myself and yes that one looks very much like the scene from “sound of music”. It a very picturesque place. 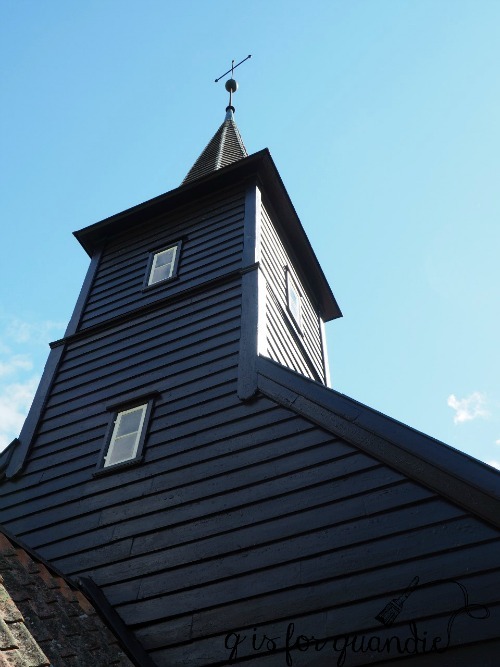 I love all the white houses and then the church building is black very unexpected. I can just imagine how beautiful that is against the snow in winter. Add to that the fjords. You’ve almost convinced me to consider a cruise. If you ever do consider a cruise, one like this should definitely be at the top of the list! 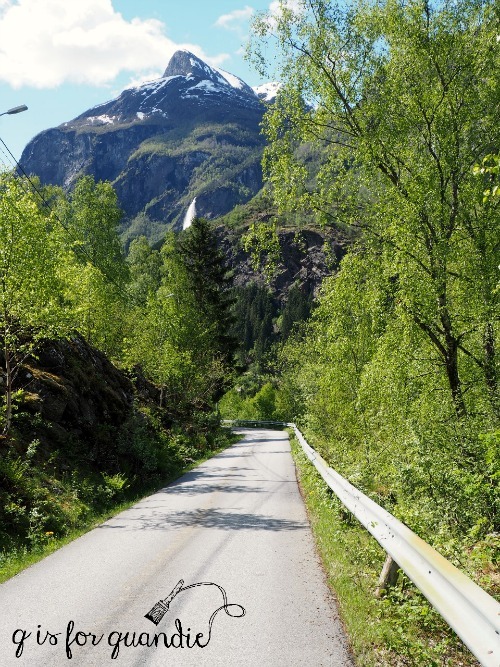 You absolutely should visit Norway Meggan! Especially if you have extended family there. It’s beautiful and the people are so welcoming. I’ve been visiting your past posts…what a lovely trip! Thanks for sharing the phitos…it’s on our bucket list. As Nike says, just do it!